Mentioned is the way you can write. People looking for jobs can easily download these BS (Telecommunication Engineering) Resume Template in word or pdf format or just view it online to copy and paste. 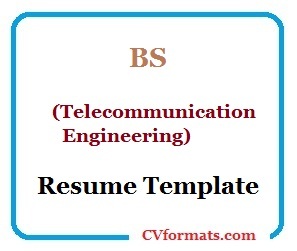 Cover letter of BS (Telecommunication Engineering) Resume Template is also available. Just change the name , address , qualification and experience and your BS (Telecommunication Engineering) Resume Template is ready. H# 06, ST# F-12/7 Taramari Tarlai, Lahore. To work in a competitive and challenging environment where grooming opportunities are available and knowledge can be utilized to its fullest potential. Looking for an opportunity to work in the field where gain of working skills is possible by participating in job tasks. I am interested to enhance my professional skills, accumulate knowledge and experience for the mutual benefit of organization and my career. Hardworking and Consistent for the sake of my work. COMSATS institute of Information Technology, Lahore. PIES Inter College Sitara Market, ISD. PAEC Model College, Nilore, ISD. Permanent Address HOUSE # 6 St # F-12 Mohala Irfanabad, Taramari Tarlai, ISD.  Exploring the latest technology. Internet browsing and web surfing for research, developments in science and technology. Being attached to the teaching field, Interested in training and coaching.